The revolution of mini diving for all is on ! Enjoy the beauties of underwater life with MiniDive: a unique, simple and lightweight system that allows everyone to breathe underwater for 20 minutes ! The Ultime Seabob Experience, you like the Seabob on the surface of the water ? You will love it underwater, explore the underwater world up to 20 mins with the Seabob Carbon, the fastening system for the Seabob is included in the package. The MiniDive Carbon makes you the new James Bond ! The basic Carbon pack ! This pack includes the MiniDive Carbon (1,1 L) that has up to 20 mins autonomy with its high quality harness that give you the hands free underwater. 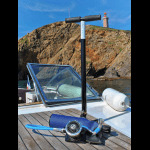 The MiniDive Carbon can be filled by: a scuba compressor, a DIN or Yoke filling station or the MiniDive mini electric compressor. The simple Carbon pack ! This pack includes the MiniDive Carbon (1.1 L) that has up to 20 mins autonomy. Its filling will be very quick and easy with the DIN filling station included, as much as the high quality harness that give you the hands free underwater. This pack is the best if you have a big diving tank. The simple Carbon pack ! 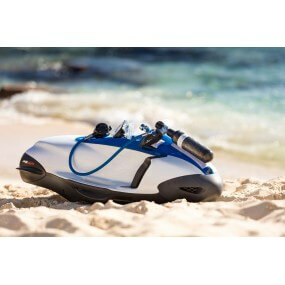 This pack includes the MiniDive Carbon (1.1 L) that has up to 20 mins autonomy. Its filling will be very quick and easy with the Yoke filling station included, as much as the high quality harness that give you the hands free underwater. This pack is the best if you have a big diving tank. The more convenient Carbon pack ! This pack includes the MiniDive Carbon (1.1 L) that has up to 20 mins autonomy. You will fill your tanks very quickly with the mini compressor included, as much as the high quality harness that give you the hands free underwater. This cool pack is the best for a frequency use of the MiniDive Carbon (1.1 L). The perfect pack for sharing the underwater experience with another person ! This pack includes two MiniDive Carbon (1,1 L) with 20 mins autonomy for each tank. You will fill your tanks very quickly with the mini compressor included, as much as the high quality harness that give you the hands free underwater.